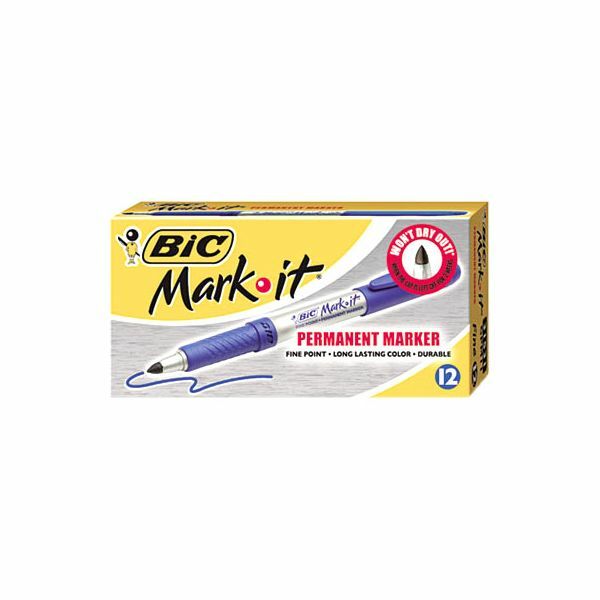 BIC Marking Permanent Marker, Fine Bullet Tip, Deep Sea Blue, Dozen - Permanent markers are permanent on most hard-to-mark surfaces. 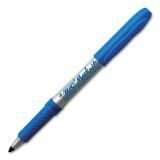 Feature a silver barrel and a textured rubber grip for comfort and control. True-to-form fine tip provides smooth ink flow with fade-resistant, bright, vivid colors. 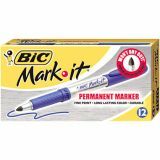 Quick-drying ink marks on most anything. Cap color indicates ink color. 12-color set includes Fandango Pink, Playful Purple, Deep Sea Blue, Blue Skies Blue, Hot Aqua, Forest Green, Key Lime, Yellow Blaze, Sunset Orange, Rambunctious Red and Tuxedo Black.